Last fall I had the great pleasure of meeting Alie Shaper. It was at the Verity Wine Partners grand tasting in New York City. Brooklyn Oenology was born out of Alie Shaper's love for three powerful forces: wine, art, and the creative energy that emanates from Greenpoint to Red Hook and beyond. 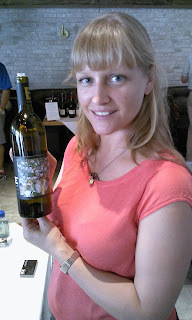 An engineer by training and a winemaker by trade, Alie launched the project in 2007. Alie is incredibly nice and bubbly, and he love of wine and her love of art are infectious. 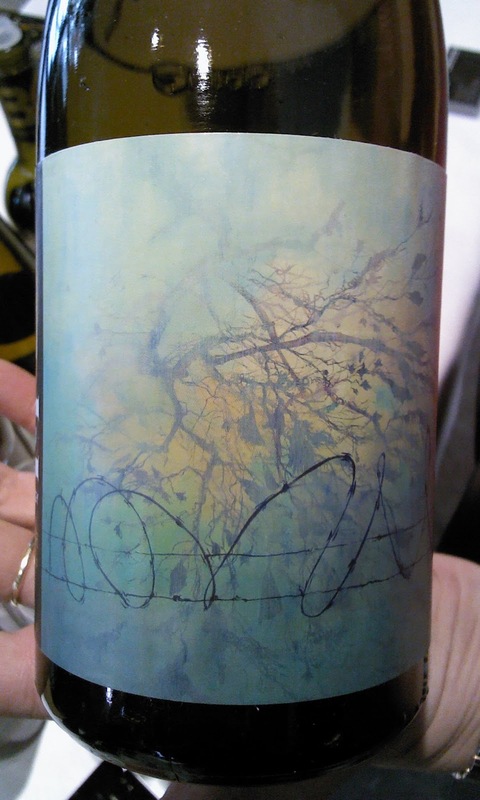 Now, I am not an art critic, but one of the fun thing about these wines are the labels. I really can't go into all the labels on a portfolio length review, but I can say that when you look at each wine individually, the art work is quite fascinating. And it's such an important part of BOE, it would seem insane to review the wine without mention of the labels. These are accomplished artists with rich, wonderful resumes. It's impressive. Alie told Scoutmob.com "There were no tasting rooms, no wineries established here at the time, and so my inspiration was kind of Brooklyn Brewery. Brooklyn used to be a hub for breweries, we used to have 48 different ones, and they all disappeared and died away until Brooklyn Brewery came along. The concept of making alcoholic beverages in Brooklyn is not a new thing, it just had died away. And since those guys showed up, quite a few other craft brews have come up in the city, and it just made sense to me: if beer can do it, why not wine? I mean, duh! [Laughs]. But the overarching concept of the whole thing was not only to make wine, but to make wine that's a part of the Brooklyn fabric. That day I was taking a walk, I was looking at these warehouses and thinking about the history of Brooklyn as hub of heavy industry; there have always been things being created or made here. But that "heavy industry" moved out ... and in its place there are now all of these new creative endeavors. It's artisanal industry." Brooklyn Oenology Winery (pron. 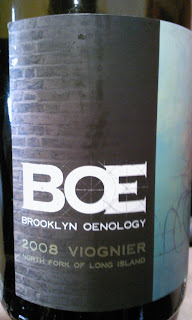 ‘EN-ology’, or simply ‘BOE’), is a locally focused winery based in Williamsburg, Brooklyn founded in 2006 by winemaker Alie Shaper. 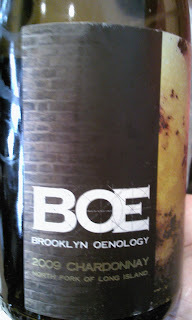 Brooklyn Oenology wines are sold in over 150 stores and restaurants around NYC and beyond, and BOE has received a strong response from many arts and culinary organizations as well. Last November the BOE Tasting Room and Gallery opened on Wythe Ave. & N. 3rd St. in Williamsburg, where they hold regular shows of their label artist’s work. 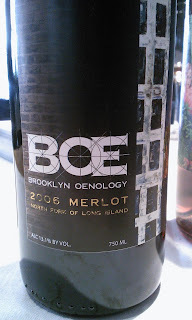 BOE does not own vineyards; they purchase fruit directly from New York vineyards, and then manage our winemaking, from harvest through press to fermentation, tank and/or barrel storage, and then into the bottle. Currently they are fermenting at Premium Wine group, the well known facility in Mattituck on the North Fork of Long Island. BOE is self-distributed, and also works with three regional distributors in New York, New Jersey and the Mid-Atlantic region. As it stands now, the portfolio is primarily whites. I did not get a chance to discuss with Alie if she had plans to expand her red wine selection, but a brief passing though of her website shows some smaller runs of other red blends. 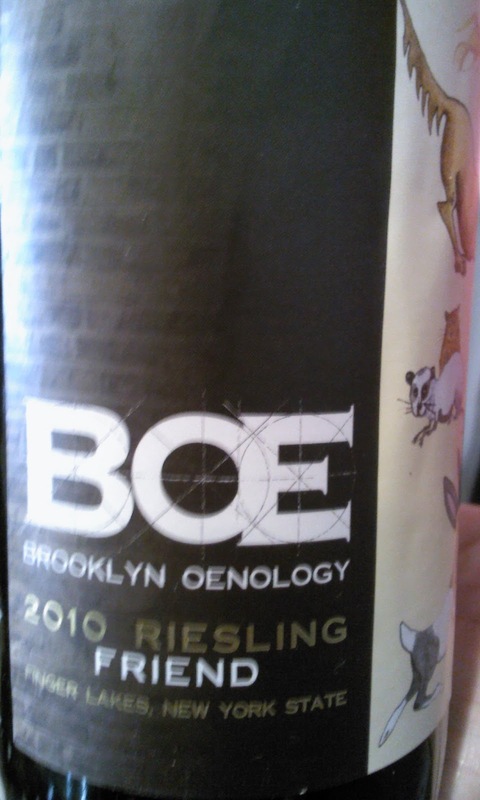 The wines from BOE are wonderful. The whites are especially fantastic. The style is often light and bright, letting the fruit come forward. This is is a lovely, light chardonnay. Golden in color, with a wonderful apple pineapple, and hints of honey, vanilla, and spices. Nice mineral flavors. This is a lovely wine. Here's an example of a BOE label from the 2010 Sauvignon Blanc. Margeaux Walter, ‘Sunday Afternoon’ © 2010, Digital C-print, 40” x 60” Margeaux Walter is a mixed-media photographer, born in Seattle, Washington, and now living in New York City. She studied at the Maine Photographic Workshops in 2000 and Tisch School of the Arts at NYU 2001-2006. 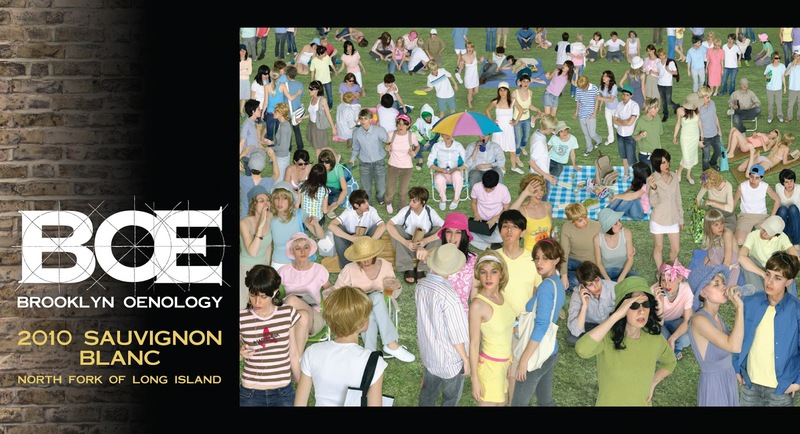 In 2007 she founded a not-for-profit art collective called SuperGlue, which has collaborated with several communities around New York City creating arts workshops and exhibitions. Margeaux’s work has been included in various shows around the country, including solo exhibitions at the Nohra Haime Gallery in New York, and Winston Wachter Fine Art in Seattle and New York. In 2009, the Magenta Foundation chose her as a top emerging photographer in the United States; she was awarded Juror’s Choice at the Butler Institute of American Art’s National Midyear Exhibition; and she was commissioned to create a large-scale outdoor installation for the Art Omi Fields Sculpture Park in Ghent, NY (up by where I live...my backyard). She has attended artist in residence programs at Red Gate Gallery in Beijing, China (2011), and the Montalvo Arts Center in Saratoga, CA (2012). 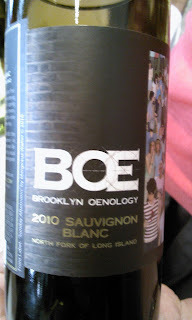 The BOE Sauvignon Blanc is a giant nose full of tropical fruit salad with a big back bone of grapefruit and lemon. Wonderful acidity keeps it very bright, with nice minerality coming through. It finishes with a brilliant refreshing pop! Fantastic! “Every year thousands of pets are a­ffected by poorly made food. They are our companions and family members, sentient beings that require and deserve quality sustenance as much as humans – but there are very few regulations that govern pet food quality,” Alie writes on the BOE website. 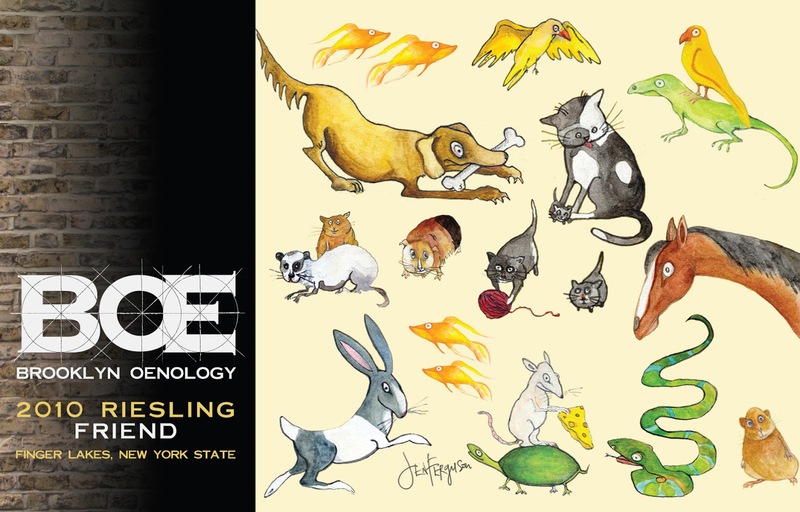 “In honor of my own friend, a portion of the sales of every bottle of Brooklyn Oenology ‘Friend’ Riesling will be donated to causes that support making food safe for all of our friends.” The label is a work of art depicting various pets from dogs to cats to snakes to goldfish and beyond. 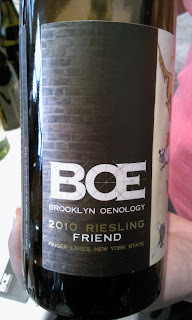 BOE’s “Friend” Riesling is a light, bright off­-dry style of Riesling. This nice thing about this Riesling is that the slight sweetness of the fruit is balanced by a wonderful acidity which gives the wine a nice little zippy ending that keeps it quaffable. Lots of stone fruit here, with apples dominating like Macintosh and Golden Delicious, with the pair, white peach, and nectarine coming through. Again, there’s some minerality coming through as well. Very nice! 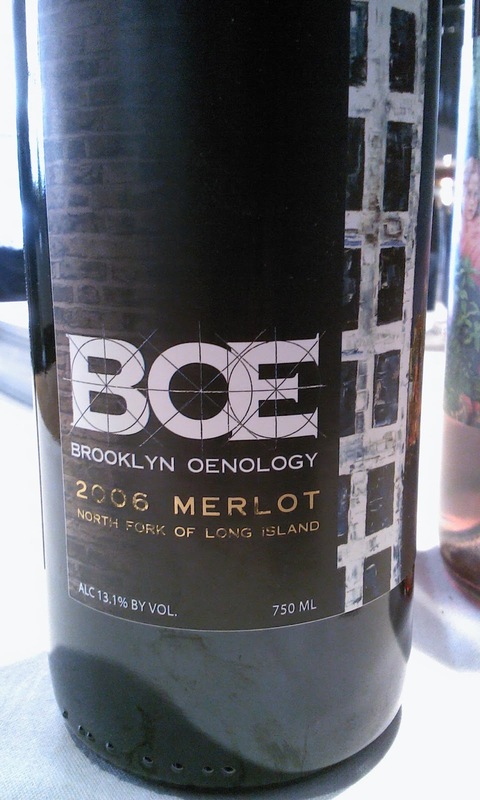 BOE’s 2006 Merlot has a deep red color to it. The wine is largely Merlot with a bit of Petite Verdot and Cabernet Sauvignon to round out a more mature flavor profile. There are huge flavors going on here…as promised the black cherry and blackberry, currant, and pepper all come through. There’s a hint of fallen leaves and mocha to it as well. A hint, a whisp of dark chocolate. You could drink it now or lay it don it for another five years or so. A lovely, impressive red. 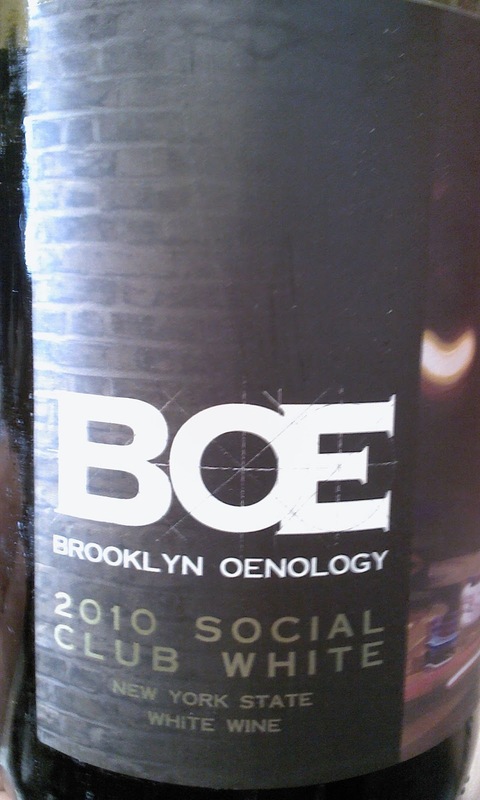 If you haven't tried any of the BOE wines, you really need to get there, or find a bottle or two and try them. They are wonderful! Richard Olsen-Harbich Wins Unity Award 2013!!! Inspire Moore Red Wines from the Finger Lakes!! !